The 2012 NDAA allows any person, including American citizens, to be indefinitely detained without charge or trial, sent to a foreign country to be held, and even executed. Not a single law has eradicated more of our Constitution protections since the Civil War. Now, Arizona has a chance to defeat it. Arizona has the chance to become the first state in America to enact real protections for its citizens against the NDAA. HB 2573, introduced by Rep. Carl Seel, passed Committee 6-2 last month, and passed the Rules Committee yesterday. Yet, one Representative does not see the tide turning to liberty. Representative Andy Tobin is currently blocking HB 2573 from receiving a full House vote. He is willing to kill protection for the people of Arizona, and allow the Federal government to trample the rights of his constituents. We will not allow him to block this bill. The rights of the people of Arizona depend on it. Show Rep. Tobin the tide is turning in favor of liberty. Urge him, politely but firmly, to bring HB 2573 up for a vote. If you have to leave a message, ask him to call you back. If you send an email, ask for his reply and tell him to honor his Oath. Forward this crucial message on to friends and family. lawsuits to waste more of our money. Want to fix NDAA? Vote everyone out of congress who voted “Yes” – THEY are the ones responsible. And why now? Why are you all fired up over a couple of sentences in the military funding bill that merely reaffirm powers the federal government has claimed it has under the Patriot Act for a decade? “… any person, including American citizens, to be indefinitely detained without charge or trial, sent to a foreign country to be held, and even executed.” – this is from the Patriot act. Why aren’t you fighting to have the SOURCE of those “powers” overturned? 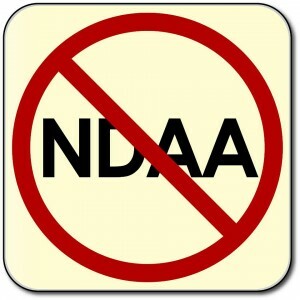 The NDAA is rewritten every year. Without it the military gets no money, packs its bags, and goes home, because that pesky constitution says that money can not be appropriated for the military for a term of more than two years. The NDAA part is easy to fix – it will fix itself on September 1, as long as we pressure our representatives to NOT include that wording in next year’s NDAA. Feel free to tilt at your windmills all you want – *I* will use my time and effort to solve the problem at the source – the traitors in congress that wrote and continue to renew the Patriot Act. Ish, You make a lot of sense. Wish you all would consider taking on the 2006 Animal Enterprise Terrorism Act (AETA). It was passed by Congress and signed into law by President George W. Bush on November 27, 2006. The law was pushed through Congress by wealthy biomedical & agri-business industry groups such as the Animal Enterprise Protection Coalition (AEPC), the American Legislative Exchange Council (ALEC) and the Center for Consumer Freedom (CCF), and updated the 1992 Animal Protection Act. The AEPA was put on the books in 1992 by well-funded industries that exploit animals. The language of the AETA sweeps up constitutionally-protected free speech activities, such as picketing, boycotts and undercover investigations if they “interfere” with an animal enterprise by causing a loss of profits. So in effect, The AETA silences the peaceful and lawful protest activities of animal and environmental advocates, while providing harsh criminal penalties for those who “harm” any of these industries.